art students huh? can't live with them, can't live with them. in my years of long hair and indian influenced jackets, to say nothing of the patchwork flared jeans, i lived in a guest-house whose proprietrix took pity on poor, destitute students, compelled to shelter and feed them during term-time. it was a veritable home from home, if truth be told. if memory serves correctly, there were a total of eight of us in the house, as well as the landlady's two daughters. as is the nature with student accommodation, after the first year, a couple of guys moved out, and newbies moved in, presenting the ideal opportunity to cause mischief and enjoy a bit of humour at someone else's expense. in this particular instance, the names have been forgotten to protect the guilty (and innocent, come to that), but on the first monday of the month, we informed one of the newbies that it was customary to dress for dinner; an awkward tradition to be sure, but something our landlady had imposed upon us. he of course did as was bid, not wishing to stand out even more than his newness had already incurred. thus dinner on that particular first monday of the month was spent midst incessant sniggering as the long-term residents sat dressed in jeans and t-shirts, while the poor hapless individual ate an excellent meal dressed in suit shirt and tie. a trivial and unnecessary attempt at humour, but hey, that's the way we rolled in them days. of course, the corollary of this story was the monday at the beginning of the following month, when the rest of us sat dressed to the nines, with the landlady's daughters wearing sparkly evening dress. our man without portfolio attended in jeans and a t-shirt. endless mirth for all the family. cycling can almost be seen in the same light. who hasn't been filled with fearful trepidation turning up to a collective ride with complete strangers, wondering if the dress-code in any way encompasses the particular pairing of jersey and shorts du jour? or even worse, entirely the contrary. i am no technician when it comes to space-age fabrics moulded into the shape of a cycle jersey, but as one without any pretensions towards space age cycling (i'm not even advanced enough to be a luddite), i prefer my jerseys to exhibit a modest sense of decorum. this decorum should not find me being compared to one fitted within a team gb skinsuit. i have, therefore, on more than one occasion, celebrated the advent of sportwool; yes, it features a percentage of polyester, but that is superbly mediated by its partner in comfort; merino wool. that's our cycling heritage; itchy wool jerseys with a front pocket and a proclivity for meeting with the rear tyre when the rain comes down. only our cycling heritage has been modernised; now we can wear wool, inhabit its grandeur and look sartorially elegant even in the depths of the peloton. 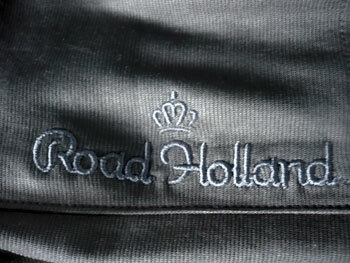 road holland is a new brand for me, based in florida, north america. i'd love to kid myself and impress upon those around, that i am well versed in the wherefores and whys of the world of cycling. sadly my special powers deserted me in this instance. and why on earth is it called road holland? "As Americans, The Netherlands / Holland is really inspirational for us because it is a country where the bike is more than just something used for a Saturday morning ride. ÊIt is a part of the culture and used for transportation and sport. ÊWe would like nothing more for Americans to adopt aÊsimilar attitude. ÊAnd of course, as more people ride for more and more reasons in the States, they will need clothes that work in a variety of situations. ÊThat's where we come in. ÊPlus, orange is the national color of the Netherlands and it's my favorite color. ÊIt was a natural fit." the words are those of jonathan schneider, company president of road holland. all their jerseys have eschewed the dye-sublimated polyester beloved of the really fast brigade and are fashioned from the magical sportwool. why? "We like materials that retain their performance properties no matter what you do with them. ÊA lot of people do not understand that the moisture wicking properties of polyester go away after 30 or 40 washes. At the end of a season, your poly jersey may look great but it's not performing.ÊÊWhen you think of it that way, wool is the best alternative and the best value because its wicking and thermal properties last forever.ÊHowever, straight wool is just too heavy for our climate and can turn people off with its legacy of scratchyness. Blending poly and wool gives you a really soft material but one that will keep its performanceÊqualities over time." road holland's richard grossman was kind enough to send over one of their den haag jerseys, featuring a chest hoop of white and an incredibly pale blue carrying over to both short sleeves. the main body is what i might describe as mint chocolate. (other colours are available) but what differentiates the den haag jersey from its peer group is the button up, polo shirt style collar. 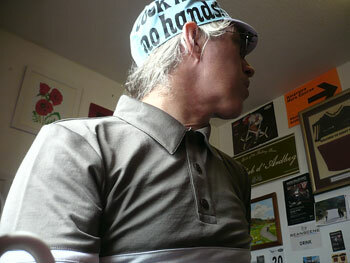 i had to explain to my son, its cycling heritage as opposed to being mere casual wear. that is it's cunning plan and secret weapon. flims and fripperies are, of course, precisely those, unless their profile lends a pragmatic level of je ne sais quoi during velocipedinal activities. however, there is no getting away from my oft repeated mantra that it surely requires a substantial degree of chutzpah to bring yet another cycle jersy company to a fast becoming saturated market. "Nothing worthwhile is easy. However, ÊI do not think the market is saturated - at least not in the States. ÊWhen I start showing up to rides where a 1/4 of the riders look presentable, then I'll start to think about it. ÊAnd cycling is growing here, so there is a big opportunity." presentability is entirely subjective, but a valid point of view nonetheless. 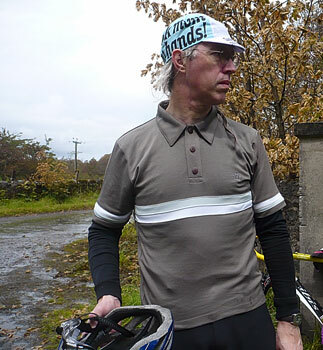 the factors adding up to a modern cycle jersey have not been overlooked. the fit is comfortably loose; not flappy, but not figure hugging either. the rear scalloped pockets sit above a droptail, keeping the lower back away from the elements when in the drops. this is aided by some gloopy stuff on the hem to prevent it riding up. 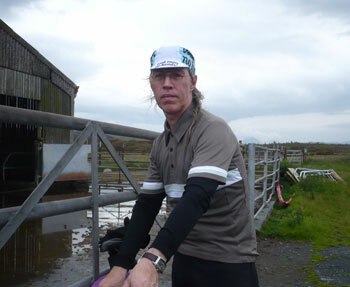 i cannot deny that this is the one area of the jersey i felt could have been tightened up slightly; with a digital camera in one of the outer pockets, all became a smidgeon saggier than its sartorial qualities had promised. on the bike this is of little or no consequence, but standing around outside debbie's, trying to look too cool for school with a coffee stained upper lip, my svelteness was slightly undermined. though the road holland bit offers some sort of a clue, why's it called den haag? "We name each product after a town in Holland. ÊThe more tailored and formal nature of Den Haag reminded us of the world court. ÊÊRichard and I have some dear friends who live in the Netherlands and I've spent a lot of time there. Our Arnhem jersey is named in honor of theÊhometown of our friends." who does jonathan see as the archetypal road holland customer? "Someone who is a very enthusiastic rider. They appreciate the history of biking and good fitting and looking gear. ÊBut they're not crazy about it. 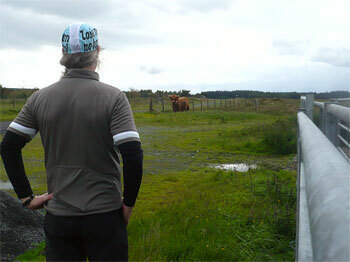 They realize riding is about experience - discovery of new places and friends. ÊÊIf they're on an "epic ride" and see a unique opportunity to get an ice creamÊon the side of the road or visit a cool shop, they're going to stop and check it out. ÊIt's not just about hammering and suffering for them. i cannot pretend that scotland's current weather pattern bears any resemblance to summer, though it is perhaps something we may have to get used to. low temperatures and incessant rain do not conjure up the mental picture that had me serenely floating along narrow islay lanes, sweat glistening on my bare forearms and perhaps one or two of those collar buttons loosened to ease the warm airflow across my merino baselayer. the reality involved breathable waterproof jackets and a winter-weight, long-sleeve baselayer under the den haag jersey. at least it did on day one. subsequent rides provided the grey-skied opportunity to lose the waterproof into one of those back pockets. it may add something to the colour of this narrative to point out that said jacket removal was witnessed by a large, brown highland cow. rural life at its best. is anything missing? well, at the risk of being endlessly tedious, in this day and age, i think every jersey ought to feature a zipped security pocket midst the standard fare. sadly the den haag is bereft in this department, and i would humbly suggest to road holland that they may like to consider this as a possible upgrade. minor and relatively trivial points aside, this is a pretty funky cycle jersey, one in which any member of the road-going fraternity would be proud to be seen. and all this for the princely sum of $120 (£75). "Admittedly, we're not the cheapest in the category but we are certainly not the most expensive by any stretch. ÊWe think our price is in line with the quality. People know when they are getting gouged and that breeds resentment for a brand over time. "As we are mainly internet focused, we are definitely international. We've sold a good deal in Europe, Australia, and New Zealand and see that continuing."